Big Joe Turner had a unique career in music that encompassed a wide swath of thetwentieth century. Born in Kansas City on May 11, 1911, he began singing professionally in the late 1920’s. His voice and his sound were able to cross the artificial boundaries designed to be heard by the public in one direction or another. Blues, rhythm & blues, jazz, big band, jump blues and rock & roll were all labels and genres associated with Turner’s music. Turner was most famously stuck with the brand “blues shouter,” which also was affixed to his contemporaries such as Jimmy Witherspoon, Wynonie Harris, Jimmy Rushing and double threat, Eddie “Cleanhead” Vinson, who wielded a mean alto sax. These titans of toughness could stand in front of big bands and hold their own with large ensembles. Their urban, uptown, sophisticated sound was aimed directly at adult African-American audiences, but had broad appeal that reached further than that. By the mid 1950’s however, the larger and much more lucrative white youth market was the focus of the record business. The music that Turner helped to create would become known as rock & roll. At that time songs sung by Turner, a 6’2” 300 pound black man exalting the merits of whiskey drinking women, bawlin’ and jelly roll, became harder to find on the airwaves and in jukeboxes. By this time Turner and his contemporaries were all but finished as being viable commercial entities. It has been said that Big Joe Turner left rhythm and blues, early rock & roll and whatever people wanted to call these robust sounds, but the fact is that the music business left Big Joe. There was nothing left for Turner but to try and make a living singing with smaller combos in smaller venues or wherever an icon from another era could find work. However, Turner kept his chops intact throughout the decades of the 1960’s and 70’s and continued to make some compelling music. He made a series of recordings in the 70’s on jazz impresario Norman Grantz’ Pablo Record label which rate as some of his finest work. Big Joe was still singing the blues like nobody who had come before or since, yet too few were paying attention. By the early 80’s, Roomful of Blues became a nine piece ensemble which had a sound that was both low down and uptown. They had grease as well as some spit polish. All of it was dished out with a powerful finesse that was the byproduct of their steady, constant touring. The band packed a wallop and their greatness could not be denied. They excelled at several different styles of blues, but were the only band out there which could come close to conjuring up a very respectable version of the post war Kansas City sound. They did better than that; they nailed it and even added to the language by attaching their own signature swagger to the music. Roomful of Blues, as it turned out, was at its artistic and popular zenith. They began to perform in larger and more prestigious venues across the country such as New York City’s famed, Greenwich Village night spot, The Bottom Line. Pomus ended up producing two albums with Roomful of Blues on Muse Records. The first is the collaboration between the band and Eddie “Cleanhead” Vinson which was released in 1982. On January 26, 1983, Blues Train was released. For many, including myself, it was the first time they had heard the already legendary, little big band from Rhode Island. 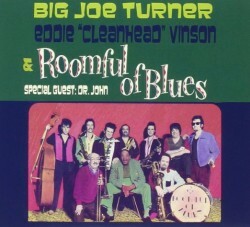 Everyone at one time or another had heard Big Joe Turner, but with this release his music was in the here and now. It is simply astonishing to listen to this album and realize that Big Joe who could easily be described (not by me, mind you) as being decades past his prime, yet he still could summon up the power, the urgency and his signature vocal styling for this recording. It was a roomful of Big Joe and it was a marriage made in heaven. I would be remiss if I didn’t run down the band; they were anchored in those days by drummer John Rossi and bassist Preston Hubbard. One of the founding members of the band, going all the way back to 1967, was pianist Al Copley. Pianist Mac Rebennack aka Dr. John sits in on one track on Blues Train. Ronnie Earl was the band’s guitarist throughout much of the decade of the 80’s and his contributions to Blues Train are marvelous. Roomful’s trombone player was Porky Cohen. He was the senior member of the ensemble and even played with Lucky Milander’s and Charlie Barnet’s bands of the late 40’s and 50’s. The band’s trumpet player was the great Bob Enos. The sax section consisted of Doug James on baritone as well as the previously mentioned tenor player, Piccolo. The alto player was Rich Lataille who is the only remaining member of the band. His residency with Roomful, like James and Piccolo, goes all the way back to the early 70’s. The album Blues Train was released on January 26, 1983. 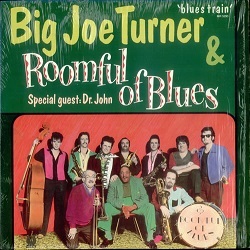 It is a wonderful late career document for Turner that puts arguably the greatest blues singer of all time in front of the greatest little big band to come down the tracks since the halcyon days of the post war rhythm & blues craze. The album’s nine tracks feature two blistering instrumentals. On the remaining seven sides, Turner and the band take some old favorites out for one last joy ride. It is as if both the band and their legendary singer know that this is their last chance to steam roll down these tracks together. They sound hell bent to show that they are the baddest band in the land and that the old man has still got it. After more than thirty years the power, passion and authoritative delivery of this recording still floors me every time I hear it. On November 24, 1985, the Boss of the Blues, Big Joe Turner, died in Inglewood, California at the age of 74. There hasn’t been anyone to come along to fill his shoes and the art of the blues shouter has become all but a dormant language. issued the album yet again. 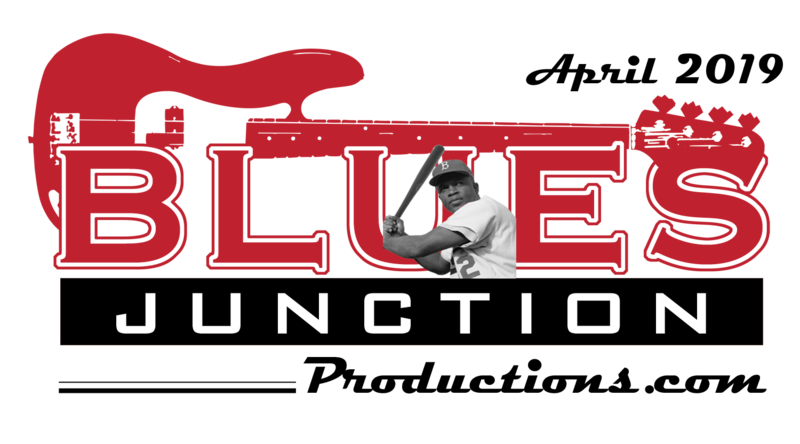 Blues Train, as well as the 1982 album by Roomful...with Eddie “Cleanhead” Vinson, are now available together on a single disc and can be found at Bluebeat Music. This CD is a snapshot of a time when two generations of musicians of the highest order came together to create music that has all the elements of what makes American rhythm & blues music so utterly irresistible. It may be interesting to note that Fantastic Voyage Records just released a wonderful three disc, 97 track compilation entitled, The Last Shout: The Twilight of the Blues Shouters 1954-1962. It seems quite appropriate that two decades later on the album Blues Train, it was the Big Boss of the Blues who got in the very last shout. Well Alrighty!